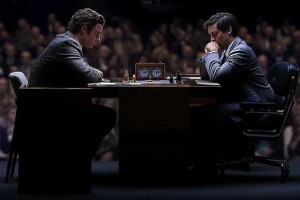 The 2014 biographical drama Pawn Sacrifice tells the true story of American chess prodigy Bobby Fischer (Tobey Maguire, The Great Gatsby) who finds himself caught between two superpowers as he faces off against the Soviet Empire’s Boris Spassky (Liev Schreiber, Goon) in the World Chess Championship of 1972. The Soviets had dominated the game of chess for decades and Spassky was considered unbeatable until a troubled kid from Brooklyn sparked an international chess craze—during the height of the Cold War—that captured the imagination of the world. 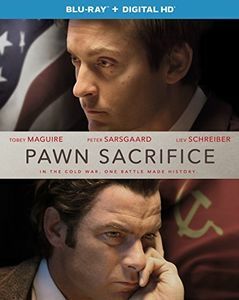 Tobey Maguire (r.) and Liev Schreiber are Fischer and Spassky in Pawn Sacrifice. Fischer was a genius but he also struggled with mental instability, and director Edward Zwick’s (Love and Other Drugs) film tries to capture the essence of his difficult personality. Unfortunately, it falls short. The early look at Fischer’s troubled childhood and challenging relationship with his mother provides a glimpse into how his paranoia and obsessive nature began to manifest, but it only grazes the surface and doesn’t delve deep enough to truly connect him with the audience. Though Maguire gives a solid dramatic performance, I couldn’t help thinking he was miscast. He works hard, but he just doesn’t bringing enough weight to Fischer’s volatile nature, which is checkered with venomous outbursts and mental breakdowns. 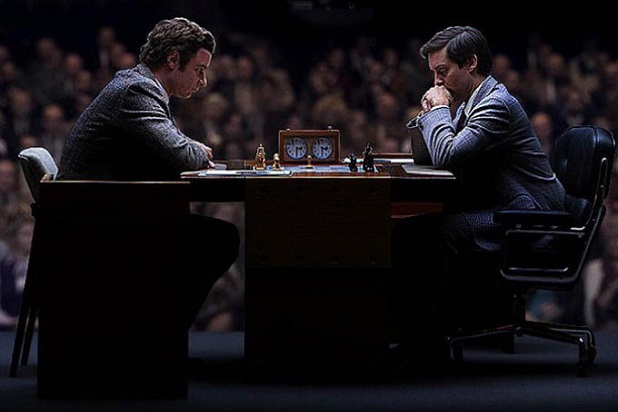 Playing out like a more-or-less standard biopic, Pawn Sacrifice offers occasional moments of creativity, which include the use of visual flashbacks to show how Fischer replays chess matches in his mind. (The film could have benefited from more inspired scenes like that.) Where it does succeed is in building the intensity and tension around “The Match of the Century.” and explaining how both Fischer and Spassky were being used as pawns for their governments to drum up propaganda for their long-term Cold War clash. A strong ensemble cast including Michael Stuhlbarg (Blue Jasmine), Peter Sarsgaard (Black Mass), Lily Rabe (All Good Things), and Robin Weigert (The Sessions) is on-board, I just wish the film had truly utilized all that talent beyond what’s we seen on the screen. The DVD and Blu-ray includes only one bonus feature – the un-illuminating, five-minute behind-the-scenes featurette Bobby Fischer, the Cold War and the Match of the Century.